Parents, don’t forget to care about yourselves too! 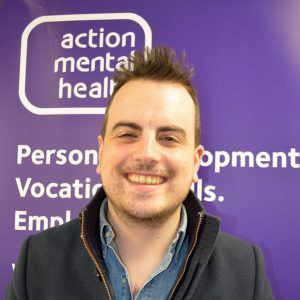 Action Mental Health has teamed up with local experts like consultant psychiatrist, Dr Phil Anderson who today – during Children’s Mental Health Week – shares his expertise on Parental Self Care. Investing in your own resilience and emotional health can be easily forgotten in the busyness of modern family life. 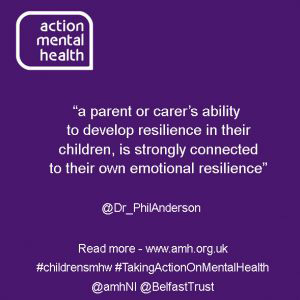 However, a parent or carer’s ability to develop resilience in their children is strongly connected to their own emotional resilience. Keeping emotionally regulated in the moment, whilst an infant is having a temper tantrum or a young teenager has an emotional outburst over house rule setting, can be one of the biggest challenges in parenthood. Dr Daniel Siegel, commented in his book, ‘The Yes Brain’ that ‘A parent’s resilience serves as a template for a child to see how to deal with challenges, how to understand their own emotions.” Part of the difficulty, can be a cultural assumption that family life can be free from arguments, tantrums and expressed emotions. When actually infant temper tantrums and teenagers emotional outbursts over house rule setting, are not always pleasant but nonetheless normal and healthy appropriate parts of growing up. Helping young people navigate and regulate through these emotional outbursts are key part of developing their resilience. Dr. Siegel states that parents who don’t run from these unpleasant emotional outbursts have a greater capacity to absorb challenging interactions with their children. He advises parents not to worry if this kind of resilience doesn’t come naturally, he says ‘with practice, it gets easier’. In the tricky moment with a distressed young person, it can be helpful to pause, take a deep breath, and ‘count to ten’. It is not always possible but it can be helpful to take this moment to regulate your feelings before trying to help your child regulate their distress. The first 3 steps for promoting resilience in your child equally apply to you. Investment in connection, understanding stress and a healthy lifestyle will help develop your own resilience which in turn can pay dividends in helping you develop resilience in your child. Thanks so much to Dr Phil Anderson for all your insightful articles this week! Our AMH MensSana team support all ages in the area of mental health and emotional well-being through a range of activities tailored to suit group needs. To find out more click here.